So Ace's first birthday came and went recently, and we ended up having his little party on my birthday because it was the only available day, like ever. I wanted something simple, a cute little airplane themed party with a few friends. Uh, simple was an understatement. It was the worst! The most pitiful attempt at a party I've ever made...poor Ace. 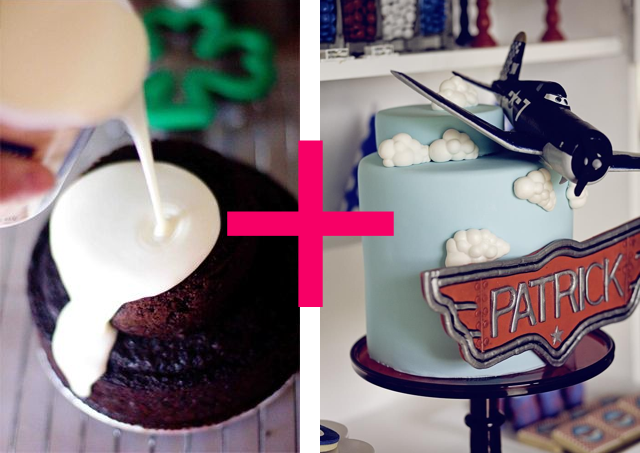 I had planned to use this awesome idea from Pinterest for pouring melted frosting onto your cake to make it look like fondant. (Genius!) And then make mini-mallow clouds and paper airplanes coming out of it. Darling, right? Bahaha!! I mean, really?! I couldn't have TRIED to make a worse disaster!! But I totally served it anyway, because cake. And it's good for me to have a nice blow to the ego now and then. :o) I welcome the humility with open arms! The one good thing (and seriously, the only decoration in sight. So. sad.) 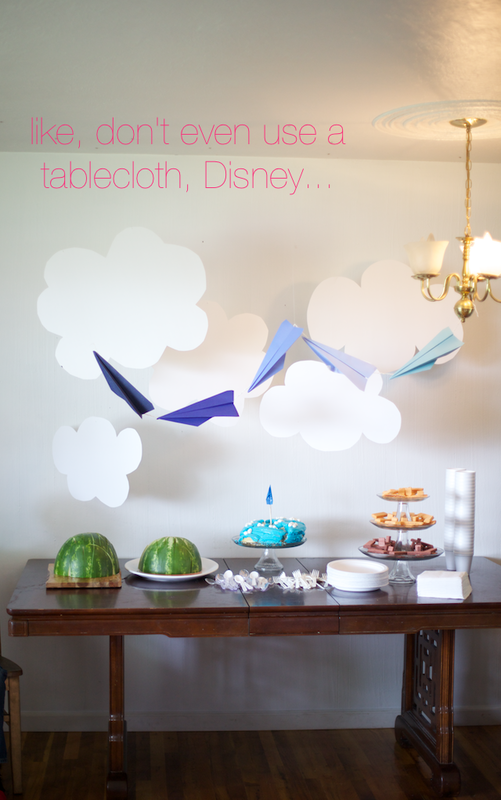 were these happy little poster board clouds that I cut out and hung above the cake table. They make me really happy! 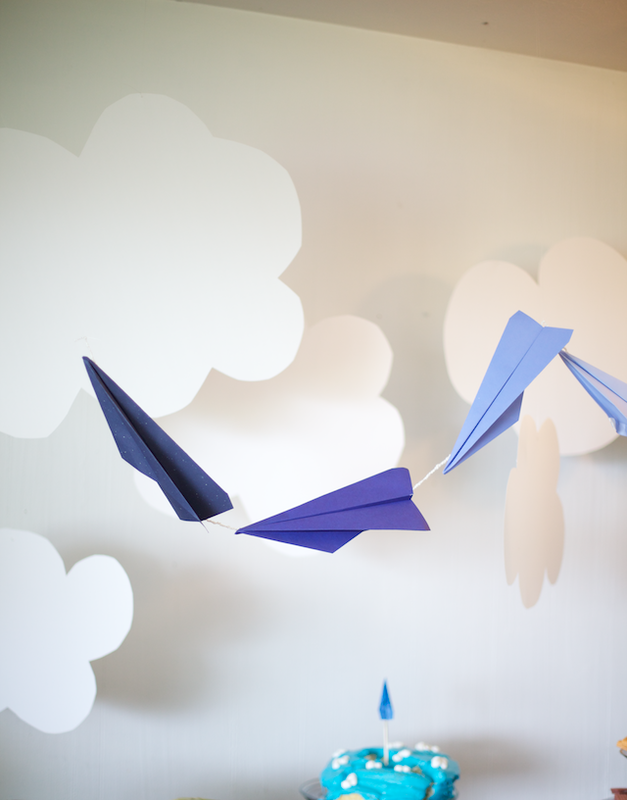 And I hung a paper airplane garland that I'd made for a previous issue of Fresh Style Magazine up in front of them. They looked so cute! Don't you wanna pinch it?!? Ace, I'm so sorry, love, I'll make it up to you with an awesome party some other year! I think my Mom used to make that same cake. I called it "crummy" cake because it was so moist, it fell apart. It was so tastey! I could have eaten it every day. Looks like "Ace" loved it! Thanks for the reminder to embrace life, even when it turns out differently than we planned! Haha, you're so funny! I make mistakes practically every time I make something, it's crazy. And yes, the watermelon was definitely the star of the show that day! Haha, that's perfect! Yes, I'll go with that theme. ;o) And thank you for the birthday wishes! 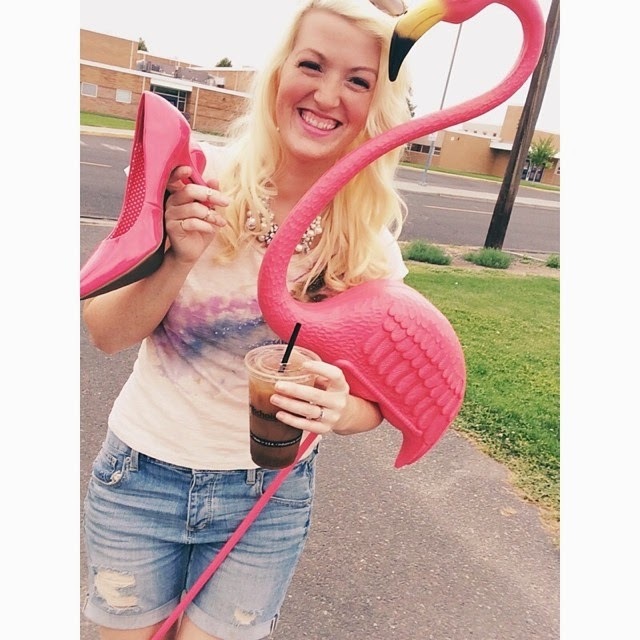 Love the theme and the rough landing according to Breenah A. We love you to death, we adore whatever you do. Happy birthday! We both share the same sign that's probably why I relate so much to how you feel. Enjoy your birthday month. Happy Birthday to you and Ace, Disney. You are so funny :-) I am sure that little Ace wouldn't have even noticed anything wrong with the cake or the lack of tablecloth. It's the friends and loved ones that count in the end. Hi ! am a bit late but WARMEST WISHES FOR YOUR BIRTHDAY! bIRTHDAYS ARE ALWAYS SPECIAL! 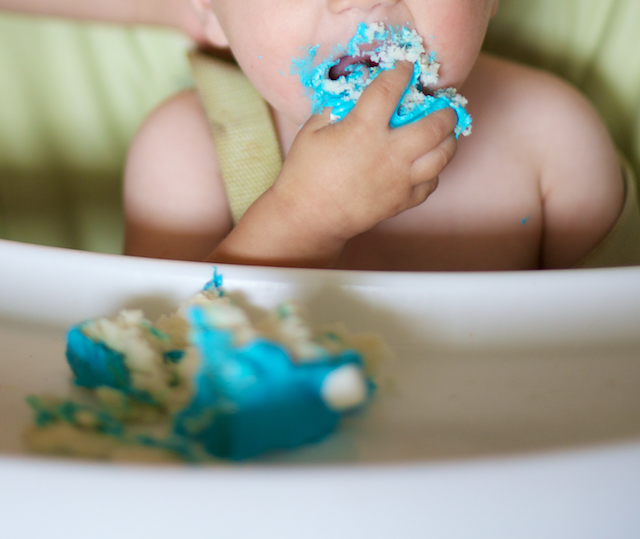 never mind if the cake crashed, it must be delicious, and I love the gorgeous blue! If it makes you feel better, your cake incident has happened to me at least 3 times that I can remember. 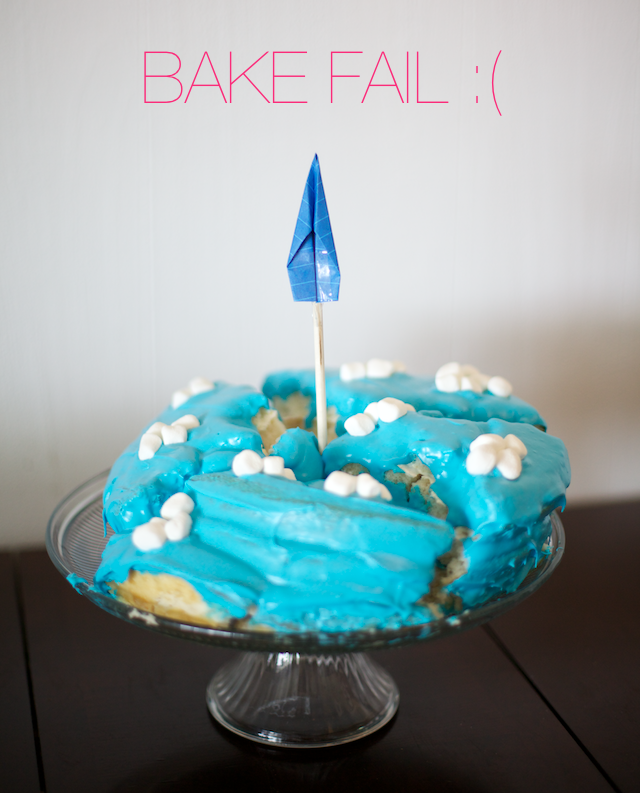 One year I took a cake decorating class where we spent about 2 weeks on one cake! It was a Thanksgiving Cornucopia cake where we spent one week making (hand molding like playdough) all of the little fruits and vegetables out of almost paste and then hand painted each with food coloring. The next week we used icing decorating tips to make a basket weaved for the cornucopia basket. SUCH a HUGE amount of work!!!!! My friend came over to pick me up to give me a ride to his family's house for Thanksgiving, I picked up the cake to carry it downstairs and out to his car to share it with his family, when...that's right... it TOTALLY flipped over and landed upside down on the floor where it was COMPLETELY. SMASHED. OBLITERATED. COMPLETELY GONE. DESTROYED. A GONER. It was UNrecognizable. I had to throw away the ENTIRE thing...b/c it was inedible. I was SOOOOO DESTROYED. I had put my whole heart and soul and effort into that cake! LOL Funny NOW... but not funny then. I was COMPLETELY devastated and depressed. No one in his family ever got to see my cake. (Let alone EAT it). 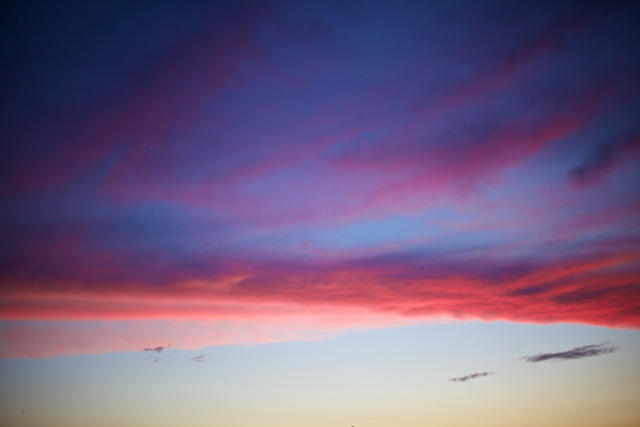 I don't think I even got to take a picture of its pre-war-torn, pre-apocalypic stage.